What a bomber!!! You have come home from the pub and find that you have left your keys indoors. Don't worry now you can use The No1 London Locksmith Opening Service. You may need your locks changed. Have you had your house or commercial property keys stolen? Or! Have you been locked out? Well! You definitely need our Kilburn 24 Hr Locksmith NW6 Service? Telephone 0208 800 6041 for an established 24 Hour Emergency Cheap Locksmith Company, who can full fill your needs. For a fast local reliable Kilburn 24 Hr Locksmith NW6 Emergency Service make North London Locksmiths Ltd. your Number "ONE" Cheap Locksmith choice. All covering the NW6 area plus all of North London, North West London and Enfield areas. 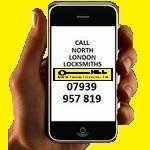 If you would like an estimate on our 24 Hr Locksmith NW6 Service, by the Number "ONE" Locksmiths......North London Locksmiths Ltd. please fill in the form below, giving as much detail as possible of work required and we will respond with an answer as soon as possible. Alternatively telephone our Locksmith shop on 0208 800 6041 where a member of our Locksmith Team, not a call centre many miles away, will give you a verbal estimate.